The Mammut Pulse was discontinued in 2017. It was replaced by the Barryvox S. Mammut will continue to support the Pulse's 5-year warranty. Summary: The Mammut Pulse Barryvox is a small, three-antenna, avalanche transceiver with a long reception range. It offers both analog and digital modes, provides feature-rich handling of multiple burials, handles spikes well, has a floating direction arrow that indicates minor changes in direction as well as points behind you, and has excellent audible indication. If the victim is wearing a Pulse transceiver (which has been configured for use in the same region), the searching Pulse can tell you if the victim is alive by sensing tiny movement—hence the name Pulse. With the 3.0 firmware update, the Pulse offers both a basic and advanced user interface. The Pulse is the feature-rich big brother of the Mammut Element. Searching: The Pulse has a long digital reception range and as with the other top avalanche transceivers, it has a recommended signal strip search width of 50 meters. The Pulse can be toggled into analog mode after changing a custom setting (which should be done in the comfort of your home). You can then press both buttons simultaneously to toggle between analog and digital. This is a nifty feature for power-users. A cool feature of the Pulse is that if you are headed in the wrong direction (which can easily happen, since transceivers simply align you with the transmitting beacon's flux lines) the direction indicator will reverse direction and point behind you. If you're heading in the wrong direction, only the Pulse and Ortovox S1 will point to the victim behind you (the Axis, Element, Neo, and Pro W will display a U-Turn icon). On all other transceivers, you will need to see that the distance indicator is increasing and turn 180-degrees. The Pulse (and the Ortovox S1 and ARVA Pro W) uses an internal compass to help you locate the victim. You need to hold the Pulse level while searching or a message may appear telling you to "Hold Device Horizontally" (the occurrence of this message was significantly reduced in the 3.0 firmware update). Audio Options: The audio options of the Pulse are unparalleled. When using the advanced profile, the audio signal is analog during the signal and coarse searches. The advantage of an analog tone is that it lets you hear faint signals (as well as non-beacon-generated background noise). Analog tones are quite helpful during multiple burials. During the fine search, the digital audio tone increases the pitch, cadence, and volume. When using the advanced profile, you can toggle between analog and digital tones. And as with the Element, the Pulse can emit "directional tones" which change the audio tone based on the direction you are headed. Search Modes: The Pulse can display either a "landing strip" or "cross fire" image during the fine search. Beginning with version 4.0, the Pulse can also display an "Intelligent Search" screen during the fine search (Mammut sometimes calls this the "assisted fine search"). You should select the desired search mode setting in the comfort of your own home. 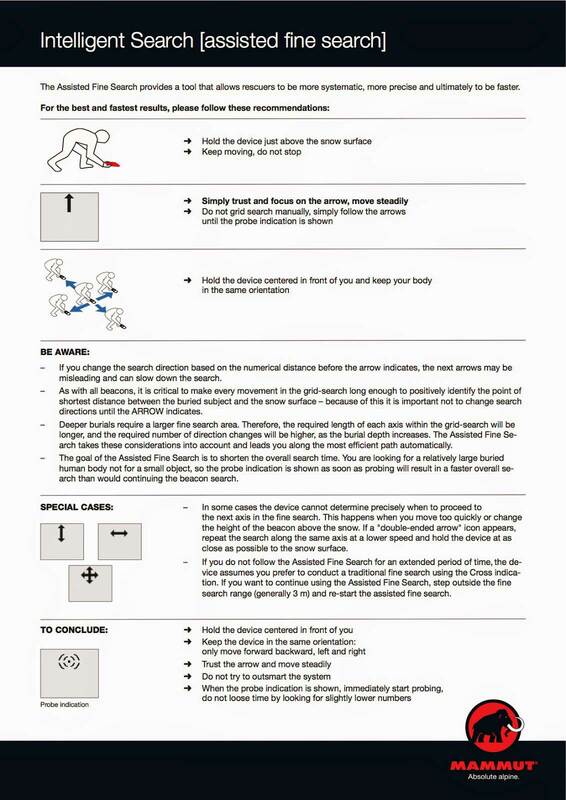 The Intelligent Search mode guides you through the fine search and attempts to reduce errors that commonly seen during rescue practice. It encourages you to only move the transceiver forward-and-backward and side-to-side without twisting, pivoting, or tilting the transceiver. This promotional video illustrates the Intelligent Search. This poster also has tips on using the Intelligent Search mode. Increased Analog Range: When in "analog" mode, you can turn off the Pulse's display which increases the reception range dramatically. This is a valuable feature for power-users. Unfortunately, this technique was not used when measuring the Pulse's analog reception range as shown in the range charts. It's a shame, because in my informal testing the Pulse received a signal at 80 meters when in this mode. To enter this long-range analog mode you'll first need to access the device's settings and ensure that the "advanced" profile is selected. You'll also want to make sure the "Analog" setting is set to "Manual." Slide the Pulse's switch to Search. Toggle analog mode by pressing both buttons. The word "Analog" will appear on the display. Press the right button to increase the volume to "A8" and then increase the volume with one additional button press. The display will go blank. Mammut states that if there isn't other interference (e.g., buildings, power lines, chairlifts, cell phones, etc), the reception range should be 90 or more meters. That's a huge range and similar to what I've seen during informal tests. Spikes: Spike handling is excellent. Multiple Burials: The handling of multiple burials is similar to most digital transceivers (you press a button to "suppress" (aka, "mark") the current beacon and advance to the next). However, as with the ARVA Pro W and S1, the Pulse also allows you to select the transceiver you want to locate and to unmark a previously marked beacon. The Pulse displays silhouettes ( ) to represent multiple victims. A number below the silhouettes states the number of signals being received. A plus sign (+) appears after the number if overlapping signals prevent the Pulse from isolating the additional signals. By default, the Pulse guides you to the nearest transmitter. After locating the victim you can press either button to tell the Pulse to ignore that victim. The Pulse will then point you to the next victim. During testing, the Pulse's marking was excellent. When using the advanced profile, you can press the left button to move through the list of signals. As you move between the victims, the distance and direction indicators are updated. Also when using the advanced profile, the Pulse allows you to unmark a previously suppressed transmitter. The selecting of victims and unmarking requires frequent practice, but it worked great during my multiple burial testing. The Pulse does not display the Mark command until you are within 6 meters. A warning is displayed if you attempt to Mark a victim that is more than 3 meters away. This is a good reminder, because you should locate the victim with your probe before marking him. Toggling to analog mode is not available. The left and right buttons perform the same task (except when you are modifying the internal settings). The searcher is always sent to the closest victim (rather than being able to select a victim by scrolling through a list). The screen display is simplified (rather than showing the distance and direction to each of the victims). A "landing strip" is displayed during the fine search (this is an option on the Pulse). Directional tones are available as a custom setting. Immediately press either button ("activated" will appear at the bottom of the screen for several seconds). Use the left button to scroll down through the list of settings. Choose OK with the right button to select a setting. Select the desired value using the left button and confirm the selection with the right button. The basic profile simplifies the interface by displaying only one command at a time and allowing you to select commands by pressing either button. The basic profile still includes all the core features, including the ability to search for single or multiple victims, mark victims, etc, but it limits the number of menus options. This is significant and goes straight at the ease of use of the Ortovox 3+, the Pieps DSP, and the Trackers, while still offering advanced capabilities not found on those beacons, such as an analog mode, an arrow that points behind you, and selective marking and unmarking. The user interface still has a few oddities that can confuse the unwary. For example after turning on the unit and immediately pressing either button, "activated" is displayed on the screen to let you know that you've activated the custom settings (and Group Check) menu. The "activated" message appears for several seconds, then "self test okay," and then "Group Check." You can use the left button to move through the custom settings or press the right button to enter the Group Check mode. I have worn the Pulse on more than 100 occasions and I'm still occasionally confused by the startup and Group Check messages. Off/Send/Search Switch: The Pulse has a single switch that moves between Off, Send, and Search. Two buttons lock the switch into position. One of the buttons must be pressed before you can slide the switch from Off to Send or from Send to Search, and both buttons must be pressed before sliding the switch to the Off position. Harness: The Pulse's harness positions the transceiver vertically on your side. 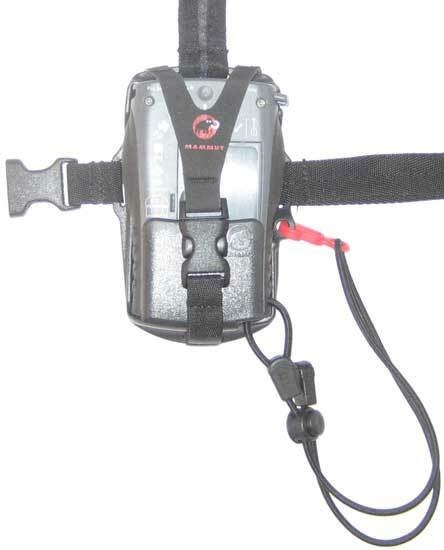 The transceiver fits into a molded-plastic case that is secured with a small Fastex buckle. The case is designed so the transceiver's display must be facing toward your body and so the beacon cannot be switched to search mode while in the harness. Good stuff. I find the harness very comfortable, but it's a little difficult to insert the transceiver into the harness while wearing it. The somewhat unusual double-threading of the straps through the buckles makes the harness difficult to adjust. Size: The Pulse is 25% smaller than the Tracker2, 22% smaller than the Ortovox S1, 4% smaller than the ARVA Pro W, and 3% smaller than the Ortovox 3+. It's approximately 15% larger than the Tracker3. There are a couple of oddities when checking your partners' transceivers with the Pulse. One, which was mentioned above, is that it isn't obvious that you need to press a button during startup to activate the group check mode. The words "Group Check" might be interpreted as the mode is automatically activated on startup. Second, a countdown timer after pressing a button when Group Check is displayed adds additional confusion (is the timer displaying the time until the group check begins or ends?). And if you get too close to the transmitter during the Group Check mode, the Pulse will display "Too close!" It really wants to be in the one meter range. These oddities are not very significant, but they can create confusion. Owner Information: You can set owner information, such as your name and email address, which will be displayed every time the Pulse is turned on. This is certainly handy, although the data-entry felt extremely time consuming even after discovering (by reading the manual) that holding the left button pressed moves backwards through the alphabet. Vitals Data: If both the victim and searcher are using Pulse transceivers (which have been configured for use in the same region, see below), the searching transceiver will report if the victim is alive by sensing tiny movement (hence the name Pulse). With multiple burials (and while using the Advanced profile), a small heart is displayed next to victims who have any movement (e.g., breathing or arterial pulses) which can presumably be used to triage which victim to locate first. The "vitals data" requires that the Pulse is carried close to your body so it can sense motion. There is a "Vital Sensor Test" where you lie as still as possible on the ground to see if the transceiver will sense the motion of your body. 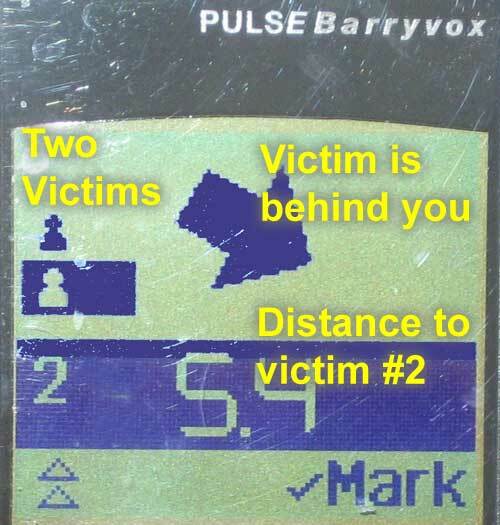 After unburying a victim who is wearing a Pulse, the rescuer can press either of the buttons to display the length of time the beacon did not experience significant motion (i.e., the "burial" time) and the amount of time the victim was still moving slightly (i.e., the "still alive" time). If the rescuer presses either button again, the display will rotate through six previous burial periods. The six burial periods are undeniably confusing (I had to contact Barryvox for an explanation), but they may be necessary if the beacon isn't checked when the victim is first unburied (so you can access information that would otherwise be overwritten by movement while transporting the victim). The vitals information is transmitted to other Pulse transceivers using a separate radio signal (referred to as W-Link). Unfortunately, the allowable radio frequency varies between regions (e.g., Region A in Europe and Region B in North America). And the FCC does not allow beacons that are sold in the USA to support Region A. If you purchase a beacon in the USA and you will be traveling to Region A, you can send your transceiver to a service center to have Region A enabled. That is impractical. The W-Link information is also used by the Pulse and the ARVA Pro W to help identify transmitters when searching for multiple victims (i.e., in addition to receiving the standard beep-beep from the transmitters, they transmit and receive serial number information on the W-Link which helps distinguish the transmitters). Certainly Mammut is proud of the uniqueness of the vitals data. I think the feature is valuable for a fleet (e.g., a backcountry ski service, snowmobile tours, etc) where all members of a party wear Pulse transceivers and everybody is in the same Region. And there are no downsides to this feature. However, I personally see only a small benefit in the vitals data—the Pulse would easily get five stars on BeaconReviews.com without this feature. Revert to Transmit: By default, the Pulse will automatically switch from receive mode to transmit mode after eight minutes to ensure that you will be transmitting if you get buried by a second avalanche. The Pulse also requires that there isn't any user interaction (e.g., button presses) or significant motion during this period. The advantage of sensing motion is that it is less likely that a searcher will unknowingly return to transmit mode during a search (which can seriously confuse the other searchers). The Pulse's auto-revert mode can be changed to four minutes or be disabled. The Pulse gives a loud audible warning before reverting. You can prevent the unit from reverting by pressing either button during the warning. The Pulse also has a "rescue send" mode (read about it here). Compass Calibration: The Pulse has an internal compass that helps the direction arrow update. As with the ARVA Pro W and Ortovox S1, the internal compass should be calibrated before the start of each season and after replacing the batteries. This is done by selecting a menu option and then slowly rotating the beacon 360°. The Pulse automatically prompts you to calibrate the compass when you replace the batteries. The users manual implies that you should also calibrate the compass if you travel a long distance, but of course the beacon will not prompt you in this case. The calibration affects the smooth flow of the search arrow-without it the arrow will be jerkier and less intuitive. The internal compass can't be used for traditional navigation. Screenless Mode: If the screen on your Pulse is broken, you can enable a special mode by holding both buttons pressed and then switching from Off to Search. You will then be in analog mode (without any distance or direction information) and can change the volume using the buttons. This is explained on a sticker that you are supposed to adhere to the back of the transceiver. 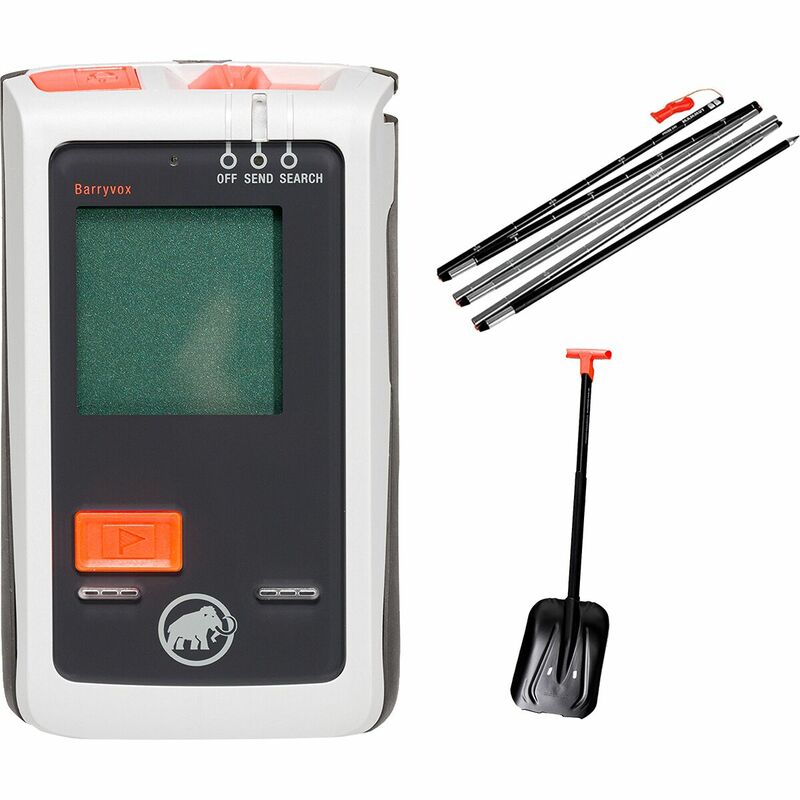 Updates: The Mammut Pulse supports software updates. You can read about updating the Pulse here. Cons: Steeper learning curve for enhanced features.